Michael Burroughs, director of the Kegley Institute of Ethics (KIE), gives thanks to the sponsors of the event and introduces the guest speaker Gregory Boyle. 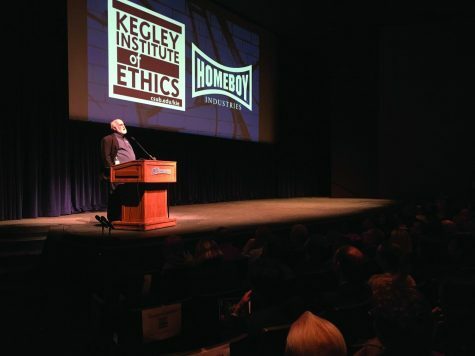 The Kegley Institute of Ethics (KIE) at CSUB hosted guest speaker, Gregory Boyle, for their 14th annual fall lecture at the Dore Theater on Nov. 13. 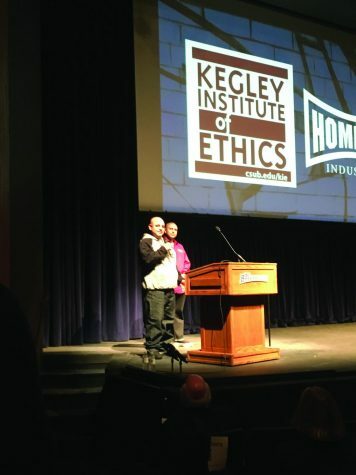 Boyle, an American priest, is the founder of Homeboy Industries, which is the largest gang intervention, rehabilitation, and reentry program in the world. 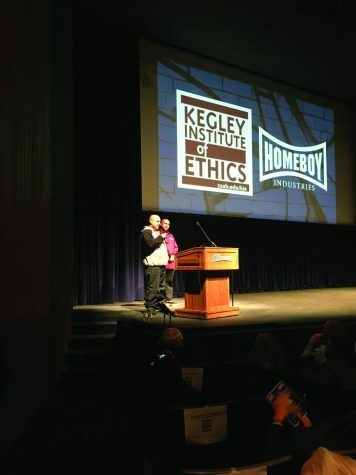 Boyle’s speech, “Gangs and Social Enterprises: The Ethics of Kinship,” discussed how he founded Homeboy Industries in 1988 and his findings regarding the importance of kinships. Guest speaker, Gregory Boyle, talks to the audience about Homeboy Industries which help ex-gang members change their way of life. 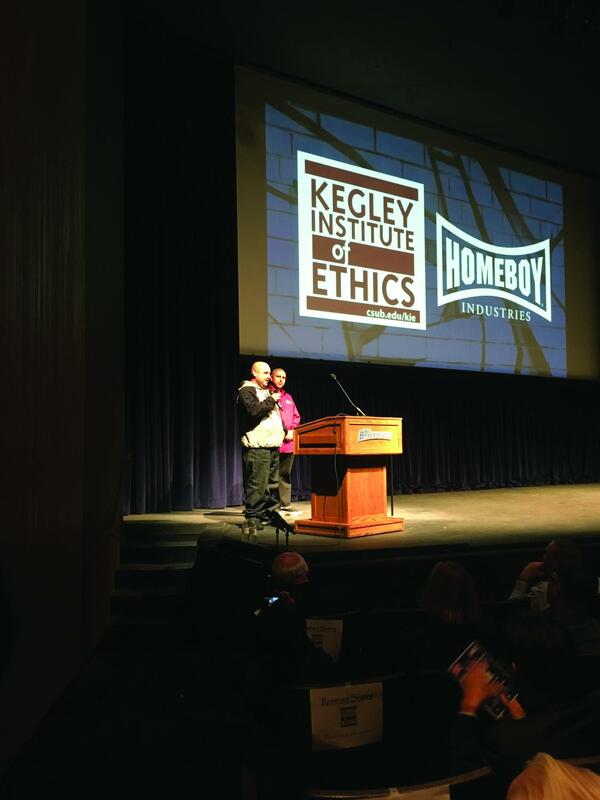 Two ex-gang members, Anthony Mendoza and Oscar Lopez, shared their stories and involvement with Homeboy Industries with the audience. Anthony Mendoza (left) and Oscar Lopez (right) talk about their involvement with gangs and how Homeboy Industries has changed them for the better. Mendoza said he left the gang and turned his life around. He has been working in the industry for three years. 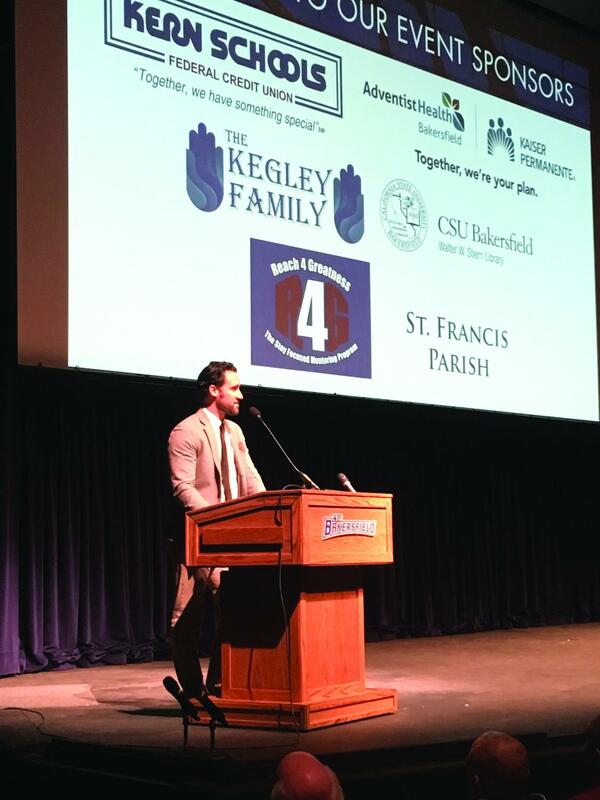 “[It] feels good being on the sober mind,” Mendoza said. The second speaker, Lopez, said he met Boyle when he was in juvenile hall. Lopez attended Homeboy Industries for a couple of years until he was sentenced 12 years in prison. Lopez said it was difficult to change his mind set at that time. “It is hard to get out of that hole of darkness,” he said. his life, and his freedom. 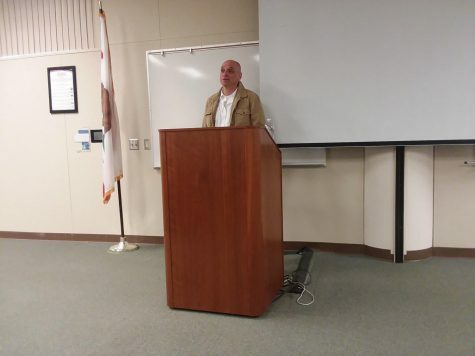 Lopez took advantage of the opportunities available to him while at Homeboy Industries, including acquiring his GED, removing gang-affiliated tattoos, and attending Alcoholics Anonymous and anger management courses. Anthony Mendoza (front) talks about his life in a gang and about how Boyle has changed his life. Oscar Lopez (back) waits to talk to the audience about his life. 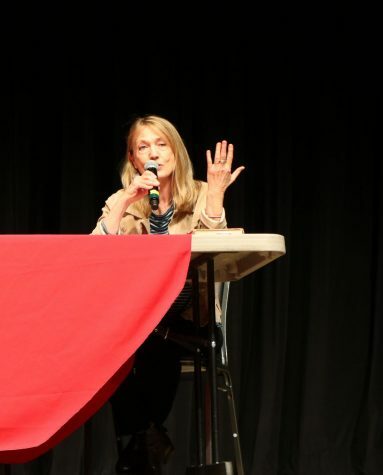 After the speeches, audience members were encouraged to ask questions during a Q&A session. Lopez said it would have helped to know his gang involvement would make guarantee him the loss of his family. about the institute following Boyle’s lecture. Michael Burroughs talking to the audience members. 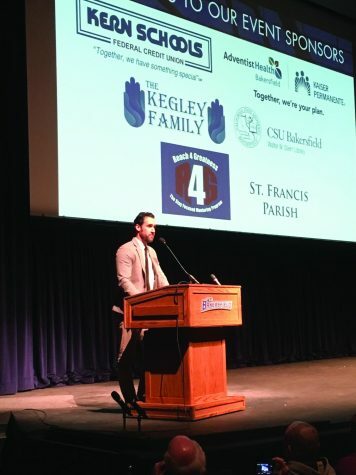 Burroughs said the KIE is an institute of ethics education research and it is divided into two ways: by campus and community. 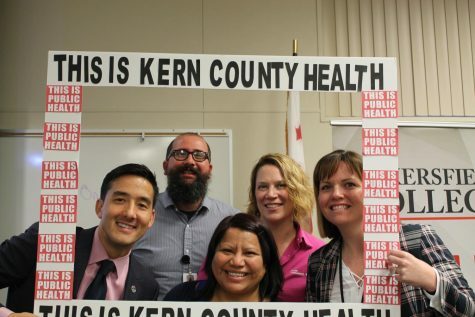 courses…If it relates to ethics we basically do it,” he said. Burroughs also shared his personal thoughts on the event. others and to be changed by them…I think it’s just a wonderful message,” Burroughs said. 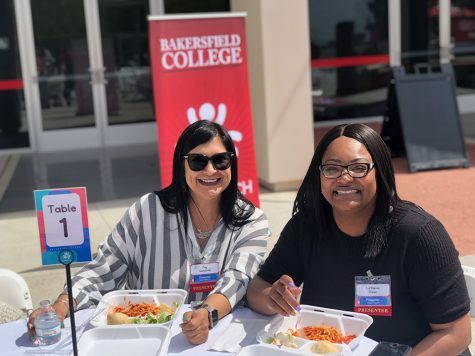 Savannah Nyagwachi, a CSUB student, shared why she came to the event. Francisco Torres, another CSUB student, said he attended the event for extra credit for his philosophy class. Torres also gave his opinion on the speech. “It was pretty fun. It was pretty interesting. I learned a lot about gang members,” Torres said.